FFM: The Ukraine: Russia's Gas Smells! The Ukraine: Russia's Gas Smells! A trustworthy source told me, although I have not been able to confirm, he read that Russia has not taken off the table the possibility of sending in troops. ** The European Union and the United States should immediately denounce this as an option. The EU and the US must send a message to Putin, probably privately, if he does this there will be severe sanctions imposed and we must be prepared to do what is necessary to stop him in his tracks. Let's not forget Putin is an ex KGB macho guy who is subject to doing irrational things. One area where The EU will need our support is Russia is a major provider of natural gas to Europe. We must be ready, willing and able to step in and fill the void that Russia may create. This will not come without cost. Fuel cost of all sorts will rise across the globe. This is a small price to pay to stop someone like Putin who will keep pushing until he meets resistance. The sooner we react to his aggression the less costly it will be. If the Ukraine decides to align itself with Russia that should be there choice. We cannot allow someone like Putin to dictate what happens in the Ukraine. 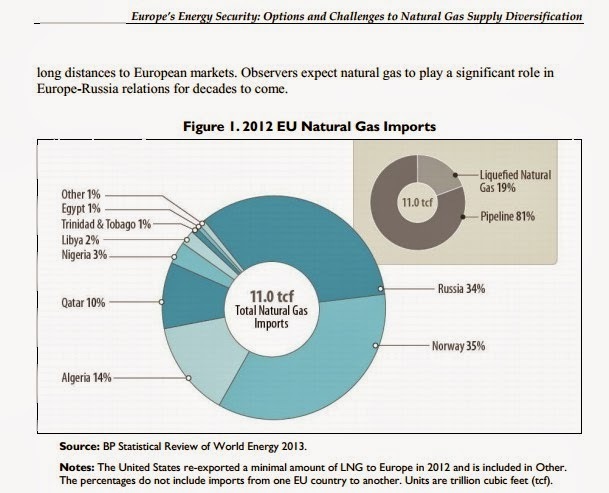 Below is a chart showing the vulnerability of the Eurozone to Russia's natural gas. We must back up our allies in Europe even if it means individually we must sacrifice. ** February 22, 2014 @ 10:16 PM EST: A previous version of this post stated that Russia indeed stated that sending in troops to the Ukraine is an option that is on the table. This has not been confirmed and as a result this post has been changed to reflect this fact.